I've been meaning to talk about this book for years now, but in my defense, I'm easily distracted. ("Squirrel!") I was reminded the other week when I stumbled across a discussion among you readers about the challenges of being an introvert among extroverts. This is a pretty common theme in the geek community, and especially here online, since we introverts often communicate better on screen than IRL. So I have a little challenge for all of you - extroverts, too! Read the book that I would say changed my life, if I wanted to be dramatic. But I don't. So instead, let's just say it changed how I see life, and other people, and myself. It made me understand introversion in a way all those online Buzzfeed articles never could, and what's more, offers nuts-and-bolts, practical advice on how to thrive as an introvert. How to use this trait that's hard-wired into our DNA, instead of trying to change it. Most books I read quickly, put down, and immediately forget - but this one has stuck with me. I've read it twice now, and even though my last read was probably two years ago, I still find myself referring to it in conversation all the time - just last week, even, when a friend was commenting on the horrors of being made to "stand up and introduce yourself" in big groups. Quiet lays the groundwork by showing how nearly everything in American society - our workplaces, our social settings, even our places of worship - are geared towards extroverts. It explains how we got here; how we as a society started glorifying people skills over character back in the 1920s, and why. (Actually a fascinating history lesson.) It contrasts these beliefs and practices with other countries that are predominately introverted, and then recommends changes we can make on both corporate and personal levels so everyone - extroverts AND introverts - can thrive. I first read Quiet on the recommendation of Felicia Day, who I love, when she made the extraordinary claim that she believed every famous internet personality was an introvert. This completely boggled my mind, even though it lined up with my (admittedly limited) experience meeting other online celebs. After reading Quiet, though, I think she's right. There's a reason we introverts flock to the internet to work and socialize. We're wired a little differently, communicate differently, and the internet is the best thing to happen to us since the invention of mini-blinds. To sum up, everyone should read Quiet, introverts and extroverts alike. Susan Cain's writing is easy to read and hard to put down, with lots of real-life examples to keep things interesting. After reading a library copy I immediately bought one for myself, because this is one I want to reread every few years. I've recommended Quiet to family and friends many times over, and I'm betting you guys will find it as vital and affirming and perspective-shifting as I have. So go, read! And if you already have read it, I'd love to hear your thoughts. What stood out for you? Any favorite nuggets? This. For me this book was a life changer too. It gave me permission to be myself and not to be ashamed that I'm never going to be the life and soul of the party. Totally agree, it should be a must read for all. There's a copy of this on my bookshelf right now... my bf is very introverted, and I am an introvert who can trick people into thinking I'm an extrovert. Time to read this book! Fantastic book! I was one of the people who commented on FB that I found this book life changing. It altered how I interacted with my colleagues and my family. I second your opinion! This is a great read and, if you're interested in the subject, can be a great starting point for a more scholarly dive into the subject. Quiet was eye opening for me in helping me better understand my introverted husband and daughter. It really is a paradigm shift in all the right ways. At the school where I teach this book was part of a teacher-focus group, my colleague who is a major extrovert read it. She was boggled, the insight into how introverts function, what drives them, what inhibits them... it completely opened her mind to not only her students, but colleagues as well. In fact recently, I (an introvert) helped her understand an unexpected event with her daughter (also an introvert). I truly believe that because of this book she has a much deeper understanding of how the introverts in her life, like her daughter, function and how to help support them too. It boggles my mind to contemplate the impact that will have going forward...wow. This sounds amazing...and now it's on the way to my house. It was a true awakening for me when I realized that post-socialization self-care was something I needed as an introvert...and that there was nothing wrong with seeking out downtime or alone time for recovery purposes. Looking forward to reading this. You talked me into it. Just downloaded a copy. Be back later for comment. Thanks for the recommendation, Jen. I'm to go find it now at my local library. Sounds like one Ill have to grab. I am an introvertn married to an introvert who manages extrovert activities well raising three boys. Life throws all sorts of things our way and this may be a good ref. I wish more extroverts in my life would read this, to understand me more. But I think it might be time for a reread myself. I want to read this one--I heard Susan Cain speak at the Willow Creek Global Leadership Summit a few years ago, and just haven't gotten around to the book. I am an ambivert, or an introvert who sometimes can't shut up, maybe. I'm shy, yet often will start conversations with strangers who are waiting in line near me. Yes! I heard the Ted talk on the way back from a wedding show where I'd had to try and sell our services and I was totally overwhelmed, then I read the book soon after and it really made me realize I am different and don't have to feel bad for it! I need to re-read as it was a while ago and I've had to deal with some very challenging workplace issues and it might help. Thank you for this ! I have a gift card to Barnes and Noble and just could not figure out a book to get. This will be it ! My 16 year old is an introvert and I am so completely not. I suspect this will be a great book for both of us to read. Thank you for the recommendation! This book totally helped me identify what I am. An introvert raised by an extrovert. I can talk and some people even think I'm an extrovert but that basically is a mechanism I had to come up with to survive living with my mom. She is extremely extroverted. All my hobbies are introverted. I own this book as well but read it awhile ago. Sounds like time for me to pull out and read again. I do remember it helping me accept my introvertedness and to speak out and up for it. I have a daughter along the same lines so I might have her read it too. Thanks for sharing this!! I'm definitely an introvert, but my son makes me look gregarious. He, being younger than I (imagine that!!) grew up with the internet as the norm. He's much more comfortable than I am online and with computers in general. We older introverts didn't have it so great, as we were introverts before the internet existed. Then we were just isolated and anti-social. So although I strongly dislike progress and, in general, the way things are...the basic norm that is accepted today...I do use the internet to a small degree to be part of the world. Susan Cain also has a podcast. It only has a few episodes but they are enlightening as well. I've learned that what I always thought of as inadequacies are not always bad. I love how she talks about creating schools and workplaces that embrace intro- and extroverts. It doesn't have to be one or the other. Yes! it's wonderful. I pretty much already understand introverts, being one myself and all, but this book started me on the path to understanding extroverts. Let me tell you, that has been indescribably helpful to my peace of mind. Y'all might want to check out the website Introvert, Dear if you haven't already. Ms. Granneman has compiled anecdotes and science that are unfailingly supportive of those of us who tend to live in our heads. Two of the things I remember from that book: because so many of us force ourselves to be extroverted in public we feel more alone than we actually are. The realization that I was contributing to the problem has changed how I interact with the world. Also, the long-term study that showed introverts don't start off with a social problem - it's an environmental issue first (sensitive to smells, sounds, new situations, etc. ), then the social troubles come because people don't understand and treat introverts poorly as a result. That was certainly my experience. 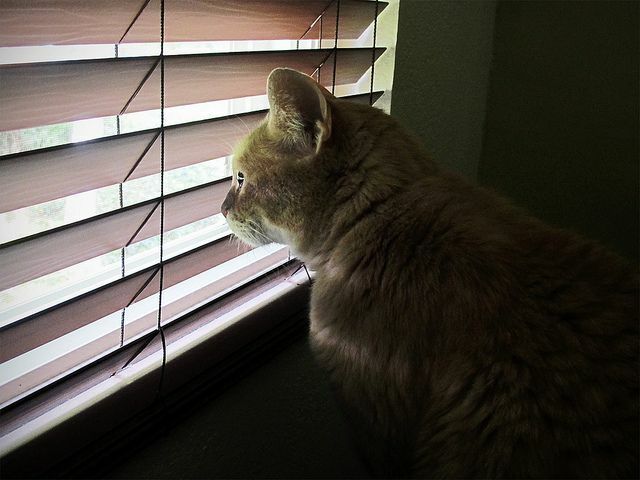 Oh my goodness, for a second I thought that was my cat Linus looking out my bedroom window! My blinds are boring (and dusty) off-white though, not fancy wood. I am convinced. It's now on the way. Thank you. I've ordered this book from the library. It will be interesting to see if I am considered an Introvert, or an Extrovert. I am fine with public speaking and around family, but social situations where I must interact with strangers or mere acquaintances is difficult. I would rather hole up at home with a good book. Or even a bad book. Ok, I'll be a moderately contrary voice here. 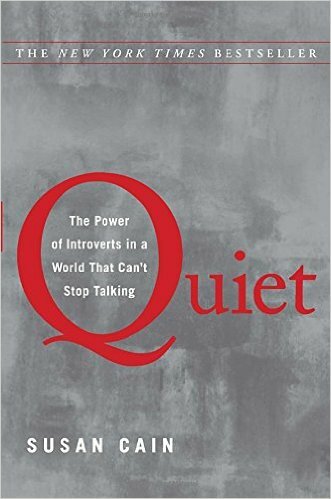 Quiet was suggested to me when I was having trouble as an introvert in law school (specifically, the same one Susan Cain went to and talks about). I liked it, but I had to stop reading it. It was supremely unhelpful in the place I was in at that time - normalizing introversion was just very counterproductive in a situation where I HAD to teach myself a measure of forced extroversion to survive. I should pick it up again now that I've made it through, though. Yes. This book! It helped me to stop feeling guilty for things I literally cannot change. And made me not feel bad about needing to take a nap sometimes. I read this a little while ago, it helped me understand myself better and as many have said, to stop feeling guilty about wanting to disappear and read a book by myself! My best friend from high school told me about this book right after it came out because she loved it. A lot of my newer MBTI books reference it, so I've read excerpts and I've had it on my long list of books I'll get around to eventually. In some ways, I've always felt my introversion was normal because I grew up in a house of introverts and all of my closest friends were introverts. It was about a year and a half ago that I discovered MBTI and realized people's differences are just in how they prefer to operate in the world using their dominate and auxiliary functions. As an introvert, the world sees your auxiliary first (because introverts extrovert their secondary preference). It explained soooo much and now I understand myself and others (including extroverts) so much better. It also helps explain how certain situations can lead to things like panic attacks for different types. If you're interesting in going down the MBTI rabbithole, take a look at personalityjunkie.com - it took me reading things about 5 times before the terminology clicked and I really started absorbing it, but it is truly fascinating! I just checked this book out of the library today as I leave on vacation tomorrow. Looking forward to reading it as I'm definitely an introvert as is hubby. Thanks! I need to read this again. I am only one of 2 introverts in my family and work in an extremely extroverted field. As a "learned extrovert" it has helped me manage my downtime so I can better function in the group settings in which I consistently find myself. It also makes sense of my hobbies which all have a cerebral and physical component but are mostly individualistic in nature, even those with a social aspect. I just finished this book. It took me a while to get it from the library on audiobook, so I could listen to it during my commute, and now I think I will actually order it so that I can read it without distractions and then loan it to people and make them read it too. I had so many moments of "oh, that's why" and have a completely new perspective on some events in my life. I was a lot like that child she referenced who made the very mature observations, but I quickly learned not to say things like that because I couldn't handle everyone gushing about how cute it was when I talked like an old woman. I'm rambling here, so I'll stop. I just wanted to come by and say thank you.